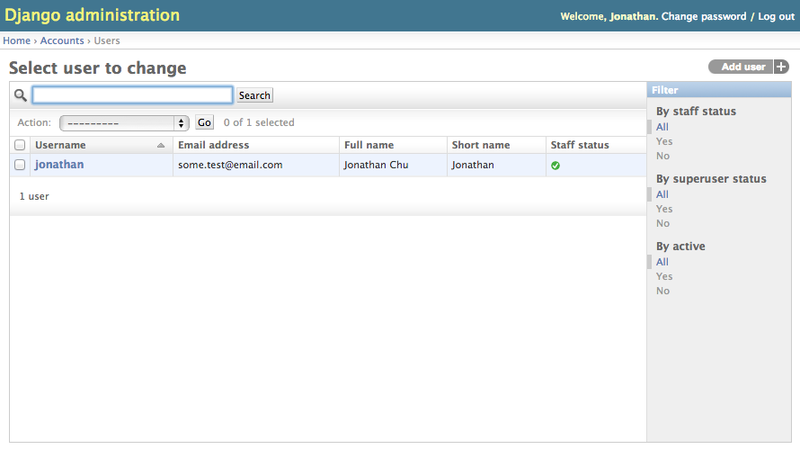 With Django 1.5, one of the biggest changes introduced was the ability to configure the user model. Anyone who has coded a Django app with a business requirement of adding a birthday field, an arbitrary checkbox to the user registration fields, or even making the signup process email-only with no usernames, knows the awkward feeling of implementing their own custom user and feeling a little less Django-esque when all is said and done. This configurable user model change alone was enough for me to 1) upgrade all my Django sites to 1.5 and to 2) swap out my customer user code for the way it should be done now with the configurable user model. The Django docs are fantastic. It is one of the most comprehensive and, most important, user-friendly documentations out there for programmers of all skill levels. I highly encourage you to read through the docs first on customizing the user model, but isn't required to understand this walk-through. If you're anything like me, you sometimes like to skim or even skip the docs altogether, and turn to Google to try and find a solid example online. I found a few, but none of them really seemed to show me a full example of configuring the user model. As a result, I decided to write my own and put it all together in an example Django project to show how I handled the custom user model. Here is the link to the repo on Github. This is going to be a brief walk-through in running this example codebase. It is opinionated, but (hopefully!) easily understood - so this would enable you to modify this example codebase slightly to fit your business requirements. Also, this custom user example is inspired from Dr. Russell Keith-Magee's great talk at DjangoCon US 2013 titled "Red User, Blue User, MyUser, auth.User" and should serve as a good example for how you can change the core fields of auth.User. Please note - this walk-through will assume you have pip and virtualenv installed locally, as we'll be using that to create the environment for the example Django project. And open up your browser to http://127.0.0.1:8000/admin and log in with the superuser you just created. Under "Accounts", you will see our custom "Users" there. Try it out, take it for a spin, create additional users from the admin, change passwords, etc. This all works nicely with our custom user model! Hopefully this is helpful to some out there looking for a solid example on customizing the User model. Any issues with the codebase, please use the repo's issues tracker on Github. Happy hacking!